Joshua Hopper IV & Henrietta Barrow are my 3x great grandparents, parents of my 2X great grandfather Jasper Joseph Hopper. Joshua Hopper IV was born in 1826 in Illinois according to the 1860 US Census. His parents are Joshua Hopper III and Sarah Sally Sheppard. You can see his parent’s Find A Grave memorials here and here. You can read my blog post about them here. 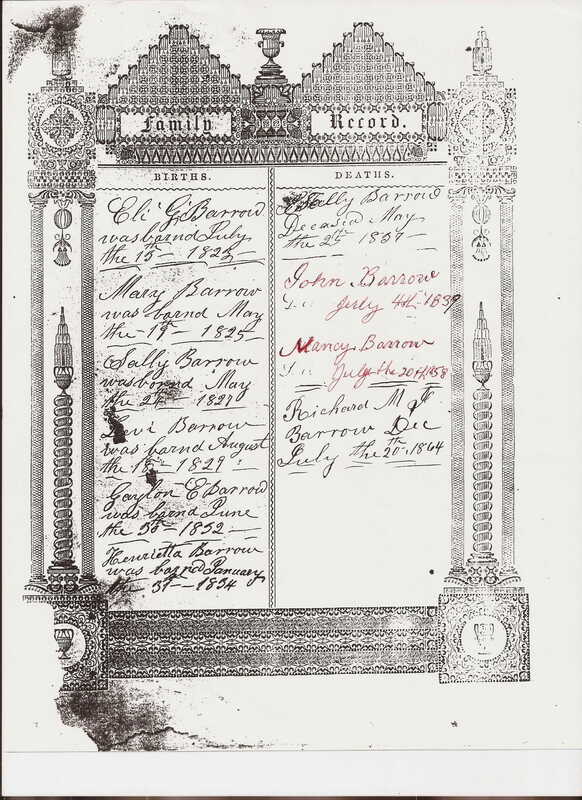 Henrietta Barrow was born January 31, 1834 near Wolf Creek, Pulaski County, Kentucky. Her parents are John Barrow and Nancy Davenport and you can read about them here. On the 1830 US Census, Joshua lived in Russell, Kentucky with father Joshua and mother Sarah. He had three brothers and a sister. There were 8 slaves in the household: 2 males under 10; 1 male between 10 & 23; 1 male between 55 & 99; 1 female under 10; 1 female between 10 & 23; 2 females between 24 & 35. I can’t find Joshua on the 1840 or 1850 US Census, so let’s talk about Henrietta. On the 1850 US Census, Henrietta was 17 and lived in Pulaski, Kentucky with mother Nancy, age 42; brothers Elijah, age 27; Levi, age 21; Galen, age 19; Thompson, age 15; Johnson, age 11; Erasmus, age 7; and of unknown relation, Fountain F. Ford, age 12. The family moved to Illinois in approximately 1853. 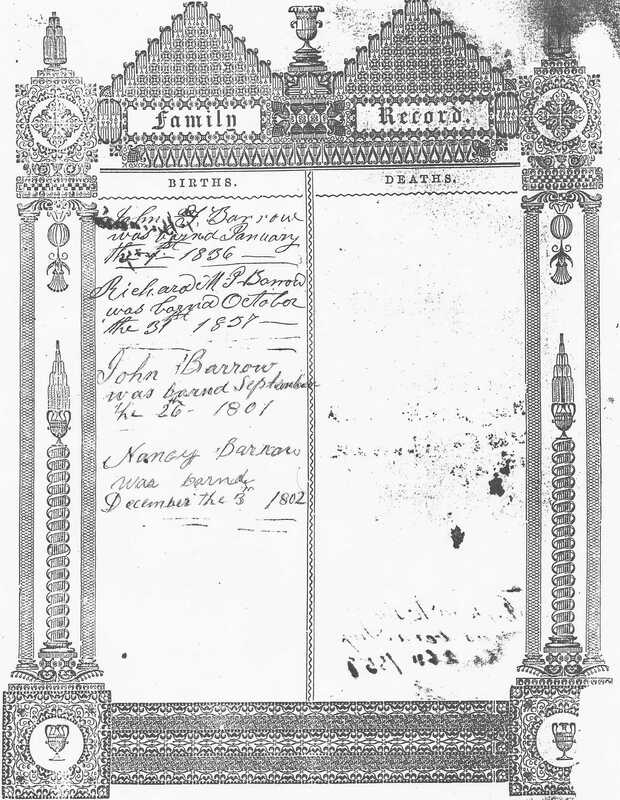 Joshua married Mary Johns on February 23, 1851 in Macoupin, Illinois. He was 25 & she was 15 or 16 years old. They had daughter Melvina in 1852. Mary died shortly after. According to Illinois Public Land Purchase Records, Joshua Hopper purchased 41 acres of land for $51.40 on July 26, 1852. It could have been Joshua or his father. Joshua Hopper purchased 40 more acres of land for $5.20 on September 27, 1854. This same land had been purchsed by Joshua Hopper on January 6, 1851 for $50. I suspect it was purchased the first time by Joshua III and purchased the second time by his son Joshua IV. Joshua married Henrietta Barrow on December 5, 1854 in Greene County, Illinois. Her mother wrote a note saying “This is to certify that I am willing for my Daughter Henrietta Barrow to Marry and do for herself.” He was 28 and she was 20. Joshua and Henrietta had a son, Jasper Joseph, in 1858, and then the family moved to Missouri. Note written by Nancy Davenport Barrow, shared with permission by Marion Hopper (m13hopper@gmail.com). On the 1860 US Census, Joshua was 35 and Henrietta was 25. They were farming in Medicine, Mercer County, Missouri. They had two children, Melvina (from Joshua’s first marriage) who was 8 and Jasper Joseph who was 2. Around 1863, Joshua is said to have died in a Civil War skirmish, burial unknown. He was 36 or 37 years old. Around 1866 widowed Henrietta Barrow Hopper married widowed John Laws. He had a son, Samuel, from his first marriage, and he had served in the Civil War. Together they had Alzada in 1868 and William in 1870. On the 1870 US Census, Henrietta was 35 and her husband John Laws was 31. There were 5 children in the household: Alzada was 2 and William was 1 month old; Jasper Joseph was 12 and Isaac Guymon was 8; and Melvina was 18. They lived in Scott, Taney County, Missouri. That census indicates that Henrietta couldn’t write. John’s son Samuel Creel Laws, age 6, was living in the area with Creel & Sarah Hopper. On the 1880 US Census, Henrietta was 47 and her husband John Laws was 43. John’s son Samuel was 16, Ada was 12 and William was 10. I don’t know where Melvina or Isaac were. The family still lived in Scott, Taney County, Missouri. Jasper was age 23 and was in the Missouri State Penitentiary in Jefferson City, Missouri. He was serving a 2 year sentence for Grand Larceny. I wrote about finding those records here. John Laws died in October 1889. His Find A Grave memorial is here. Henrietta received a Civil War pension due to his service. On the 1900 US Census, widowed Henrietta, age 66, lived with her widowed daughter Alzada Woodard in Jackson, Boone County, Arkansas. Also in the home were Alzada’s children: William, age 12; John, age 9; and Harriett, age 5. Henrietta died in 1902 in Alpena, Boone County, Arkanas. She was 68. She is buried by her second husband John Laws in the Mincy Cemetery, Mincy, Taney County, Missouri. Her Find A Grave memorial is here. Melvina Hopper – Melvina was born in 1852 in Illinois. She married William Watts in 1872, and they had a son James J. Watts born September 21, 1873. I can’t find marriage records for Melvina and William. They aren’t on a census together. I don’t know when Melvina died, but her husband remarried and they had a child together in 1877. James J. Watts died in Washington state on September 20, 1950. According to death records his mother is listed as Matilda Hooper, but considering the circumstances, I suspect her name was misremembered. His Find A Grave memorial is here. Jasper Joseph Hopper – My 2X great grandfather Jasper was born in 1858 in Illinois. He married and had a child, then married Sarah Margaret Bly in about 1800 and they had 11 children. December 16, 1929 in Ruth, Stone County, Missouri. He was 71. His Find A Grave memorial is here. You can read about him here. Isaac Guymon Hopper – Ike was born October 16, 1862 in Mercer County, Missouri. In November of 1884 he was sentenced to serve 15 years in the Missouri State Penitentiary for 1st Degree Robbery. He served 3/4 of that time. Records indicate he had served 2 previous terms. He married Darthulla Mary Catherine Sturman and they had 12 children, with the first born in 1902. On the 1910 US Census, the family was in Natura, Okmulgee County, Oklahoma and he worked as a wood chopper at a mill. On the 1920 US Census, he was teaming at an oil field in Beggs, Okmulgee County, Oklahoma. His wife died in 1926 and he died March 28, 1928 at age 65. They had buried 3 of their 12 children, and their youngest would die soon after they did. You can see his Find A Grave memorial here. Alzada “Ada” Sadie Laws – Ada was born in June of 1868 in Missouri. She married Wesley Woodard in 1885 in Taney County, Missouri. At the age of 31, she was found on the 1900 US Census as a widow in Jackson, Boone County, Arkansas. She had given birth to 6 children, with 3 of them living. Her mother also lived in the home. Ada died in 1904 at age 35 or 36. Her Find A Grave memorial is here. William Madison Laws – William was born on April 28, 1870 in Mincy, Taney County, Missouri. He married Mary Etta Childress on October 23, 1892, in Boone County, Arkansas. They had 8 children. He died September 23, 1940 in Miller, Lawrence County, Missouri. He was 70. His Find A Grave memorial is here. This entry was posted in Hopper Family History and tagged Alzada Laws, Darthulla Mary Catherine Sturman, Henrietta Barrow, Isaac Guymon Hopper, James J. Watts, Jasper Joseph Hopper, John Barrow, John Laws, Joshua Hopper III, Joshua Hopper IV, Mary Etta Childress, Melvina Hopper, Nancy Davenport, Samuel Creel Laws, Sarah Sally Sheppard, Wesley Woodard, William Madison Laws, William Watts by fillinginthefamilytree.com. Bookmark the permalink.